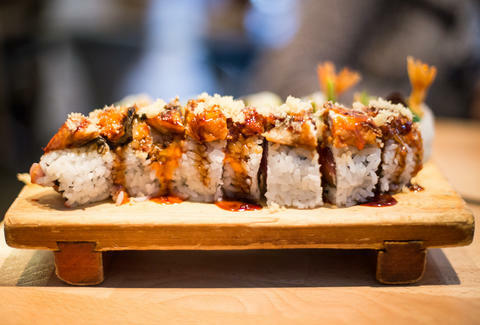 A master sushi chef will tell you that the perfect bite of sushi is the one that best fits a customer's taste, and although they mean this with the utmost sincerity, it is not true. 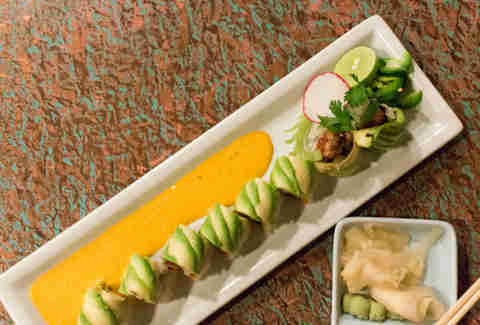 The best bite of sushi is not a roll with four kinds of fish, avocado, cream cheese, and a quart of spicy mayo. 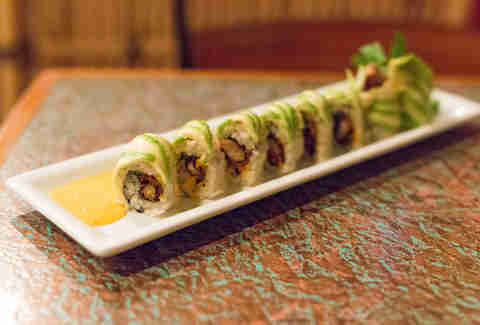 Those Frankenrolls are admittedly delicious, but if that's all you're ordering, you're doing it wrong. After reading the following reasons, we think you'll agree. No respectable sushi chef is skimping on the quality of their product, but the reality is that not all cuts of a fish are created equal. 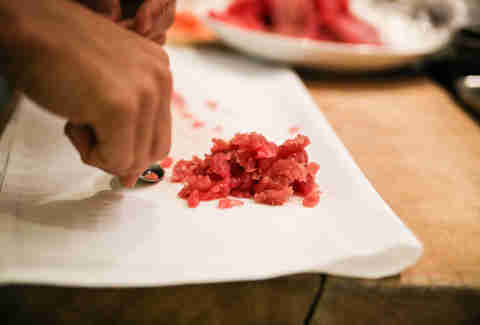 Just like a butcher isn't likely to grind up beef tenderloin for a burger, a sushi chef isn't using the prime cuts of tuna belly for a roll. What's used for individual pieces of sushi -- be they slices of sashimi (just plain fish) or nigiri (a slice of fish on top of rice) -- will be a better cut of fish than what's ground up and mixed with Sriracha in a spicy roll. Pro tip: chefs save the very best fish for customers who sit at the bar. To continue the steakhouse analogy, you wouldn't want to take a prime piece of beef and coat it in a mixture of A.1., cream cheese, and caviar. 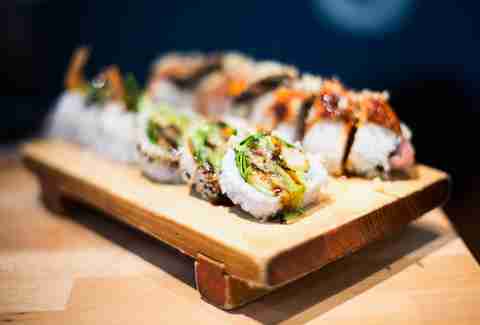 The kitchen sink of ingredients in an Americanized roll run together such that the competing fatty flavors will overshadow the integrity of the fish. 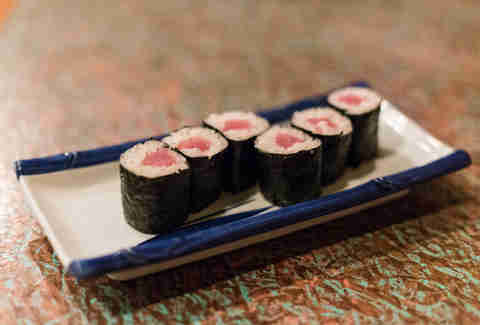 Great sushi is all about the balance between the fish and the rice. Much of that is temperature, but the contrasting textures of smooth flesh and expertly prepared rice are also crucial. 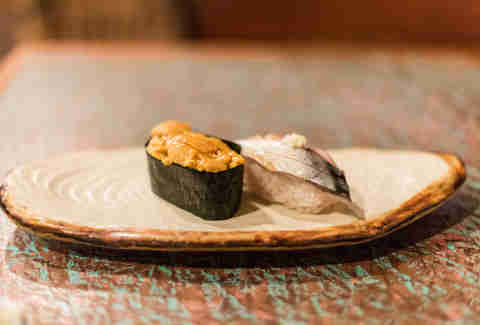 This simple balance that makes a nigiri bite of uni or saba so special goes out the window when a roll is stuffed with fake crab, topped with an aquarium's worth of different fish, and soaked in a heavy sauce. 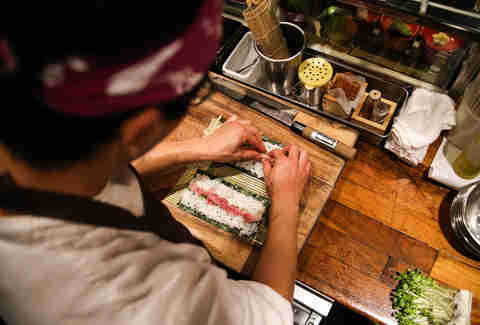 Anyone working at a respectable sushi restaurant has a serious approach to the craft, but the chef making the rolls is typically the low man on the sushi-bar totem poll. It doesn't take as much finesse, and most diners would probably be upset to know that their dinner is likely being made by the least-experienced cook on the line. Sure, a fast-food burger will eclipse any calorie count on a sushi roll, but that doesn't mean it's right to remix one of the healthiest meals around into a caloric rice bomb. Flashback to your hazy memories of Jiro Dreams of Sushi and try to remember if he was making rolls. Spoiler alert: he wasn't. That's not to say rolls don't exist in Japan, but most of what you see on an American specialty-roll menu wouldn't even be considered sushi to that affable 85-year-old Japanese legend. So, how do you quit your roll addiction? The first step towards a better sushi experience is to avoid specialty rolls altogether. These have goofy names and long lists of ingredients. Instead, start weaning yourself off with simple one- or two-ingredient rolls, or cone-shaped hand rolls. These still offer the same satisfaction and the familiar flavors of seaweed, but allow the chef to better showcase the fish. Once you've cleared years' worth of mayonnaise out of your arteries, try letting your server or chef guide you through ordering nigiri. The Japanese names of the fish can be intimidating even to experts, so don't try to fake your way through it. Servers at sushi restaurants are happy to help customers make informed decisions about the menu. It's their job. Instead of ordering an entire meal at once, start with a few pieces, then tell the server which you liked best. They'll take note of your preference and be able to guide you toward new types of fish that suit your palate. Then, if you're still hungry after working your way through the nigiri menu, order that spicy rainbow dragon roll for dessert. Dan Gentile is a staff writer at Thrillist. He loves ordering omakase style, much to the dismay of his bank account. Follow him to horse mackerel at @Dannosphere.